McFire is a 46ft Lee Cat powered by 4 x Suzuki 300hp Motors. She is a large catamaran and is all about Space and has lots of it with 1200Hp she has a top speed of 35 knots. She is the biggest boat in the Blue Water Charters fleet, and also Durban’s biggest charter fishing boat. Whether you just want a fun trip or want to head out to the deep for something big you will do in spacious comfort aboard McFire. She is the ideal boat to entertain your clients on corporate trips, or for team building. A great boat for the family, friends or for anyone that wants to fish with loads of space. She is not all just comfort and space, she is also a well equipped fishing vessel. 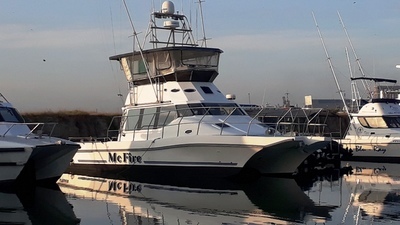 McFire is now available for your fishing trip, cruise or function.